Flame throwing, acrobatics and stilt-walking are just some of the things that will feature in an evening of entertainment that organizers are calling "one of the most exciting events of the year." On January 3, to celebrate Bermuda's 400th birthday, The Bermuda 2009 Steering Committee will shut down Front Street to make way for a night of free festivities from 7pm until 10pm. One of the highlights for the night will be performances from acrobatic group Animate Objects which is a type of "physical theatre" - similar to Cirque De Soleil. "Our committee wanted something that had that 'wow' factor," explained chairman of the Bermuda 2009 Steering Committee Conchita Ming. "And we believe Animate Objects is just that wow. The city is going to be alive with sound and music." In their performances, members of Animate Objects will propel themselves off a specially-installed 40-foot wall that is going to be built on Front Street on January 1. 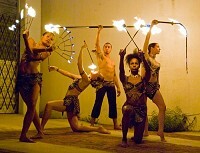 Based in Miami Florida, Animate Objects Physical Theater has gained international recognition for their high calibre performances that uniquely integrate aerial arts, acrobatic stilt dancing, fire performance and contemporary dance forms. They perform on sides of buildings, suspend from theater rafters, captivate crowds in outdoor festivals and brighten up nightclubs and private events. Animate Objects founder Ileigh Reynolds said the name of their group stems from the word 'Animate' because of it's latin root word - Anima: to breathe life into. "With our performances, we seek to inspire; to breathe life into each moment, each event," she explained. "To create a subtle shift in people. We are larger than life, and performing super human feats. Because we cross so many genres, we aren't just a dance company, nor a circus company, nor an aerial dance company. "I would say at the heart of it all, we are daredevils, risk takers and thrill seekers as we continually look for ways to 'step it up a notch' with our performances." On the big night audiences will be treated to three "larger than life" stilt dancers, performing up and down Front street in colourful, Dr. Seuss inspired costumes. Then the call of Fushu Daiko's live Japanese Taiko drumming will gather the audience for their aerial dance piece 'Ricochet.' Ricochet uses a vertical stage (the 40 foot wall) that performers bounce and flip off in synchronized choreography. Animate Objects performers dance in harnesses while rappelling down ropes. Their final performance of the night, called 'Pyrokinetics,' is a fire show. Both Ricochet and Pyrokinetics run approximately 15 minutes. Festival-goers can also enjoy the fish chowder competitions on the night - which little 'taster' cups will be handed out to be judged by you. There will also be a recreation of Bermuda's contribution to the Tattoo that was held in Virginia last year. This will include music from the Bermuda Regiment Pipe Band, among many others and will be an eight minute "musical journey" of Bermuda's history projected onto two giant screens. Fireworks begin at 10pm, which organizers promise will be unlike those Bermuda has ever seen before! Bermuda's top jazz band The Unit will also be performing. For more information or to find out how you can get involved in the festivities go to www.bermuda2009.bm.